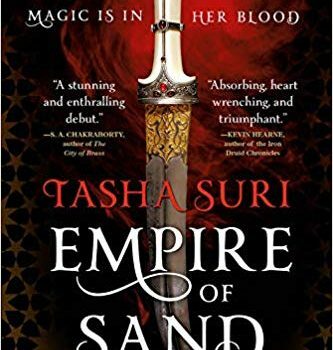 Empire of Sand, Tasha Suri (Orbit 978-0-316-44971-7, $15.99, 480pp, tp) November 2018. A reliable way to revive epic fantasy, which seems to be going through many of the same motions it’s been tracing for 60 years, is to set it in a culture other than a West­ern one – other than a thinly disguised United Kingdom, to be uncomfortably specific – but if a white writer does this, she lays herself open to charges of exoticism and appropriation, which is why it’s such a good idea for fantasy and SF publishers to bring out more books by writers of color; in one stroke, it brings fresh ideas to stale genres, and it centers voices that have been marginalized for too long. Perfect example: Empire of Sand by British Punjabi novelist Tasha Suri. It’s set in an alter­nate-universe Mughal India, in which a young woman with the blood of both a noble, ruling family and an oppressed, magical clan in her veins must claim her power in order to survive. Every single element of Empire of Sand is pleas­ingly exotic to a Western white reader like me, but Suri does not play all this up as a gimmick, nor does she contribute to the orientalism Edward Said cautioned against. She is writing a culture she knows, and it’s a culture white audiences don’t know. That makes her work fascinatingly new, but not exploitative. How is the book itself, aside from this mul­ticultural freshness? It’s good. Mehr, the main character, is sympathetic and fiery, and her journey is satisfying, with well-balanced stakes. The importance of choice crops up repeatedly in the plot, as does the tendency of dance to bring people closer and free their souls. The body matters a lot in this book: pain is written on the body, and it cannot lie, even when people can. Perhaps the villains hindering Mehr have a little too much in common, and the friendly charac­ters in servant roles are numerous and similar enough to blend together a little bit. 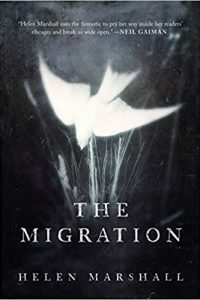 Some of the plot machinations are predictable, while others definitely aren’t; the book is well written enough, if a bit long, and it only becomes tiresome when it repeats itself needlessly. Suri needed a much more attentive editor. That marriage ties Mehr to Amun, a mysterious man from the same oppressed culture as Mehr’s mother. Suri’s characterization of Amun is novel and deeply compelling. Although this book is firmly within the fantasy genre, there’s a hint of romance-novel structure in Mehr’s relationship with Amun: the forced marriage turning slowly to real love. The pair do eventually come together, in one of the most tender and romantic love scenes I’ve ever read, anywhere – one all the more mov­ing for the (very) long wait Suri puts the reader through before it finally happens. However, the marriage also places Mehr and Amun under the thumb of a corrupt religious leader, the Maha, who is using them both for evil deeds. 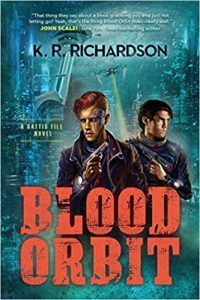 They know more about the power the Maha tries to wield than he does, and they thwart him, but not without a series of bloody consequences. 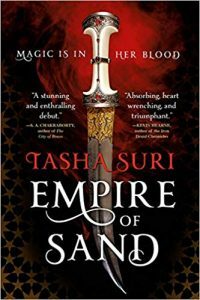 For all its faults, Empire of Sand is almost a photo negative of most epic fantasy – in its setting, its emphasis on women, the ethnicities it chooses to focus on, and its highlighting of choice rather than fate as the engine of individual lives. In this, as well as its fine characterization and its willingness to draw blood so the reader may understand what’s at stake, it’s a refreshing, worthy addition to the fantasy genre. There’s a crying need for energetic, unapologetic diversity in genre fiction, and Empire of Sand provides it admirably. 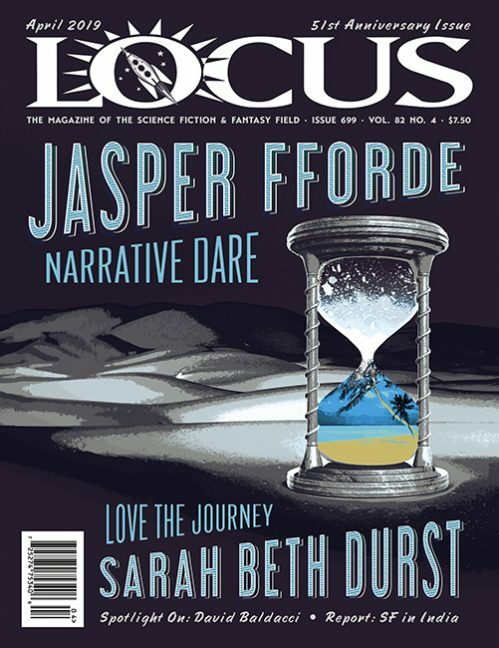 This review and more like it in the January 2019 issue of Locus. — this is simply not an accurate description of heroic fantasy as a whole; not even of the founders of the genre, like Robert E. Howard. In his “Hyborian Age” Aquilonia is more or less medieval France with a dash of England; Shem an archaic Middle East; Turan is early Ottoman Turkey; Stygia is ancient Egypt with a snake-cult pasted on; Kush is sub-Saharan Africa; the Picts as depicted in the Hyborian stories are more or less Iroquois; India and China analogues feature as well; and so forth and so on. Conan himself is basically Irish — a pre-Christian Celt. It’s a glorious multicultural mishmash, and Conan an equal-opportunity chopper-up of anyone who comes within reach. And the above quote isn’t true of, say, Game of Thrones either. 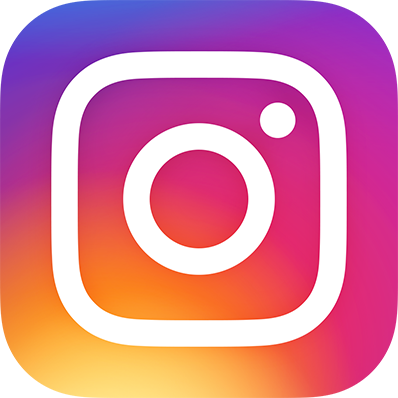 Why do people keep repeating this egregious stuff?